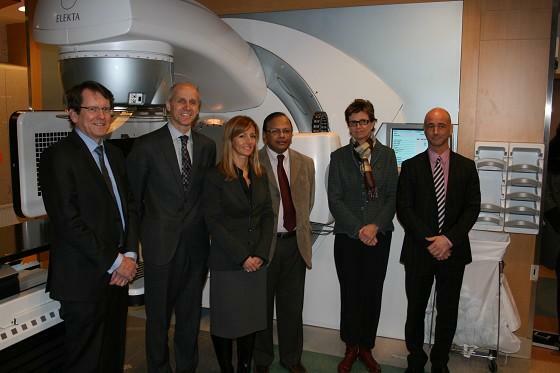 As part of an ongoing evolution in offering world class technology for Northwestern Ontario cancer patients, Regional Cancer Care Northwest (RCC NW) has recently installed one of the world’s most advanced Linear Accelerators (LINAC) – the Elekta Infinity. This complex project, underway for months, is now complete and the first patients are being treated on the Infinity LINAC. Radiation Therapy staff are fully trained on the new machine and are developing unique, customized treatment plans for patients. The advanced Elekta Infinity system incorporates image-guided workflow into a comprehensive treatment system. The new Infinity LINAC allows radiation treatments to be delivered more efficiently, contributing to fewer side effects, less time for patients on the LINAC treatment bed, and potentially, improved patient outcomes. “We’re proud to partner with one of Ontario’s preeminent cancer centers,” says Michael Power, Vice President and Managing Partner, Elekta Canada. “Elekta Infinity represents the pinnacle of radiotherapy’s technological sophistication, and in the hands of physicians at Regional Cancer Care Northwest, patients will be receiving very safe, accurate and clinically effective therapy.” The Infinity LINAC fully integrates with RCC NW’s new MOSAIQ Electronic Medical Record system scheduled to be implemented in May of this year. This will streamline clinical workflow and, because treatment planning information is downloaded to the LINAC without manual transcription and the chance of human error, the new system will make radiation therapy treatment safer. The Infinity LINAC has on-board cone beam imaging that allows a CT scan to be taken in less than one minute while a patient is in treatment position immediately prior to radiation delivery. “On-board cone beam imaging allows us to advance our techniques in the future,” says Dr. Sunil Gulavita, Head and Coordinator of Radiation Oncology at TBRHSC. “With daily imaging capability, we can target the tumour and spare normal tissue to ensure we are radiating the correct anatomy. Eventually, we will develop new treatment techniques to take advantage of the Infinity LINAC’s precision by decreasing the number of daily fractions and increasing the daily dose. Fewer fractions mean fewer visits for patients to the Cancer Centre.” “These treatment improvements are wonderful and it’s reassuring to know that our Regional Cancer Centre is always at the forefront of technical innovations,” says former radiation therapy patient and local businessman Shawn Christie. “But putting technology aside, I can’t emphasize enough how much it eases the cancer journey when patients are supported by Radiation Therapy staff who deliver expert care with compassion and commitment.” The Infinity LINAC project (including both machines) is an eight million dollar endeavour largely funded by Cancer Care Ontario – the Ontario government agency that directs and oversees high quality, timely cancer services and improved access to care for all Ontarians. “Replacing aging radiation treatment equipment is a critical component of ensuring timely access to high-quality cancer care as close to home as possible,” says Michael Sherar, President and CEO, Cancer Care Ontario. “The installation of this new LINAC is just one example of Cancer Care Ontario’s partnership with the North West Regional Cancer Program to ensure patients and families in Thunder Bay and the surrounding communities have access to a safe, sustainable, efficient and effective cancer system. Residents of Northwestern Ontario have a long history of supporting the Northern Cancer Fund (formerly the Northern Cancer Research Foundation) to bring leading-edge care close-to-home. Today, that tradition continues as the community has, once again, committed to support the investment in these new LINACs, that will ensure our friends, family, and neighbours have the very best opportunity to survive cancer.